Today Tellme, a subsidiary of Microsoft Corp. and pioneer of voice services, announced the first mobile voice service to combine content and communications, simplifying how people interact with their phones every day. 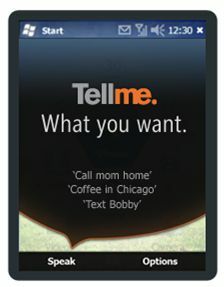 Unlike other voice-based services, Tellme is the first to allow people to press one button, say what they want and get it, whether that is to send a text, make a call or search for information. Tellme has designed a unique version of this experience specifically for Windows phones due out this fall. – Initiate a call simply by saying “call” and then the name of anyone in their contact list. – Search the Web with Microsoft Live Search by speaking your request, such as “weather in San Francisco, California”, “Pizza in Kansas City” or “mother’s day gift ideas”.